Use stained glass chips, fused glass, and beads to create a work of art for your wall! Design must be planned, and materials purchased prior to class. Select from Jennifer's themes such as Lizard Cafe, Starry Night, Abstract, Blooming Desert, or design your own. 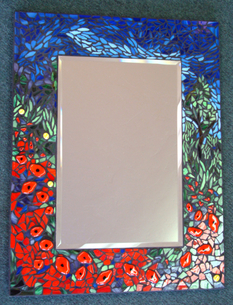 See more examples of Mosaic Mirrors on our Firefly Glass Gallery/ Student Work page. Choose square or rectangular board. There will be homework outside of class time. *Kiln firing fees are included only when using glass and materials purchased at Expressions. Additional firing fees will apply when using materials from outside sources.